This time the spotlight will be shining on Shapes of Gray, an arcade game which’ll have you blasting through levels in mere seconds… seconds! No, really! So, what say we help it escape the cold emptiness of Greenlight limbo? Shapes of Gray is a fast-paced, stripped-down action-arcade game about rapidly descending through a series of seconds-long levels, each one containing a unique combat-puzzle challenge. Use your enemies’ attacks against each other to get the high score and complete arcade challenges all while jamming out to a totally rad indie-punktronic micro-soundtrack. Simple, fast, clean fun. That’s what Shapes of Gray looks like to me, what with its chaotic, yet strategic twin-stick shootin’ battles. 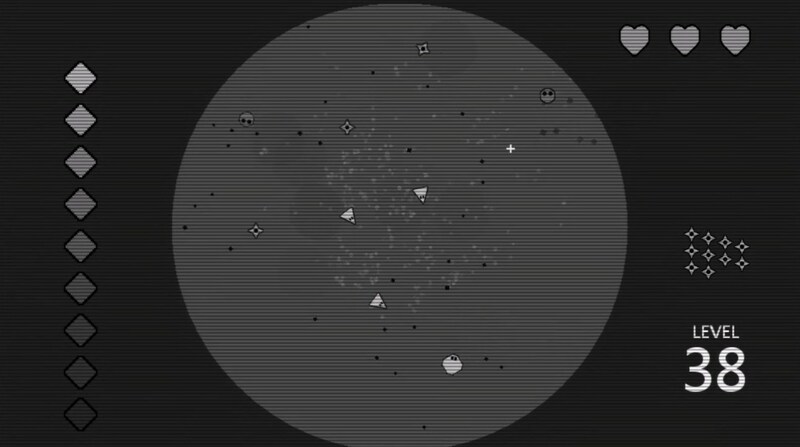 There’s also no denying the grooviness of the art department, as that grayscale look definitely matches the old-school, Asteroids-ish gameplay nicely. But what really caught my eye about it was the whole ‘combat-puzzle’ aspect, as there’s no getting through the hundreds of levels – even if each can be beat in mere seconds – without a bit of thinking, alongside the blastin’. A nice change of pace for the genre, to say the last. Oh and something something… deep hidden meaning, eh? So riddle me this, dear reader: why is Shapes of Gray still struggling to get through Greenlight? It’s been out for a while, meaning a lack of availability is definitely not what’s keeping it from getting through Greenlight! As such, how about visiting its Greenlight page and handing over a ‘yes’ if you like what you see? Remember: your vote matters! It really does.